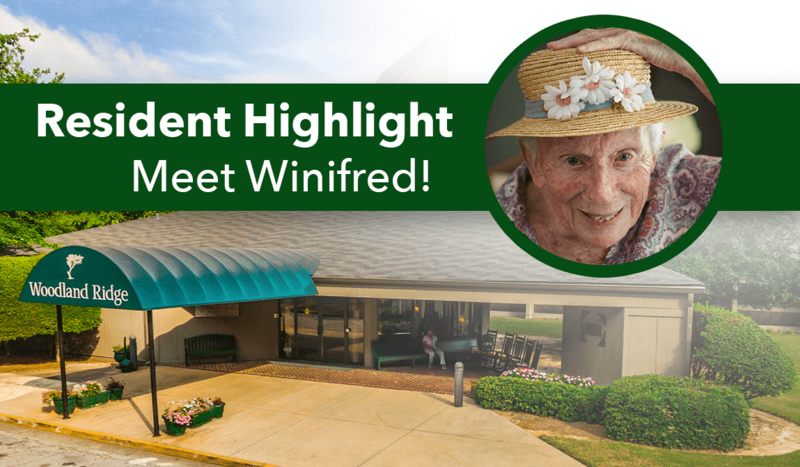 Woodland Ridge is highlighting Winifred, our April Resident of the Month! Winifred, more fondly known as “Boozie,” is our April resident of the month. Ms. Boozie was born in Norfolk, Virginia but came to Saint Simon’s Island at age two when her father became the first club pro at the golf club. Her father also taught and built golf courses across the South East becoming the pro in Albany, Georgia when Ms. Boozie was six years old. It was around this time that she got her nickname, “Boozie” from her older brother. He gave her two sisters nicknames too, and the nicknames stuck. Ms. Boozie grew up in Albany, becoming a majorette in high school and was voted the best dancer by her classmates! In her 20s, Ms. Boozie and friends would take trips to New York to go dancing and hear the latest music. Later, she went to school at Asbury College in Kentucky, majoring in voice and music. Ms. Boozie loves Opera, Gospel and Big Band music. Her daughter remembers not being able to sleep in on Saturdays because Opera music was playing on the radio. In 1954 Ms. Boozie married her husband who was a Civil Service employee for the Marine Corps Supply Center. They were both active in their church and loved singing in the choir. Ms. Boozie also taught Sunday School, worked with a young couple’s group and gave vocal concerts. Ms. Boozie has three children, three grandchildren, and three great-grandchildren. She loves kids and went back to school to earn her teaching degree in 1983. She taught 6th grade and was named teacher of the year. Ms. Boozie loves history, social studies, swimming, golf, and animals; she even trained her dogs to do tricks! Another hobby that Ms. Boozie enjoys is travel. She’s been to Alaska, Hawaii and all over Europe! With her husband, Ms. Boozie would stay at bed and breakfast homes to soak up the local culture and local food wherever she went. She is indeed a fearless adventurer taking in all she can! We enjoy Ms. Boozie’s beautiful smile and the gentle nature she shows everyone. We thank her for sharing her story with Woodland Ridge and invite our readers to congratulate her on being our April Resident of the Month!